The AG660CE-SHB is a stunning Grand Auditorium displaying Alvarez’s renowned Shadowburst, fine gloss finish over a solid African mahogany top. The flawless semi-gloss back and sides allow the guitar to resonate and the same finish applied to the neck makes for a great feeling instrument that is smooth and easy to play. Tonally, the AG660CE has the articulation a Grand Auditorium can offer with a little more emphasis on the trebles. Being made of mahogany, the projection is nicely harnessed with a really quick response which produces a more focused projection and fewer overtones, making this guitar a great choice for recording and live work. 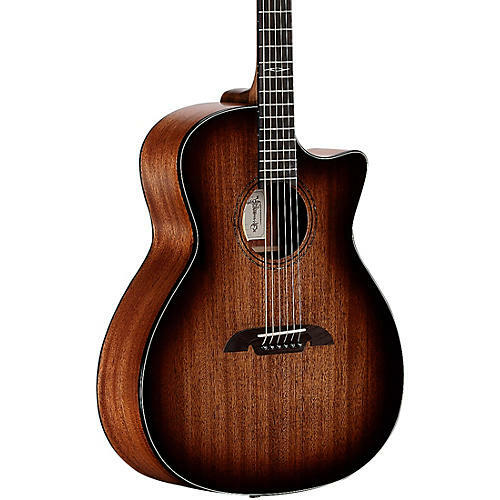 This guitar AG660CE is fitted with the discrete but lively SYS100 pickup and pre-amp which is located in the end pin and controlled by a smartly designed soundhole console offering volume and tone controls. Overall, the AG660CESHB is a smart, articulate GA suitable for most musical styles with a sophisticated voice and stunning aesthetic.